This seven-day meditation group, created by Osho, an enlightened being, consists of one hour of Gibberish Meditation and one hour of Silent Sitting every day. The No-Mind Facilitator training can be booked in addition to the group. In the first hour we throw out the gibberish of the mind. Just say everything that you ever wanted to say and have not been able to say because of civilization, education, culture, and society… And say it in any language you don’t know! …Shouting, laughing, crying, making noises making gestures. As you throw it out you will find yourself becoming light, becoming more alive. In the second hour: A great silence arises in which you have to close your eyes, be absolutely silent, gather your whole energy inwards, just like you are coming home. Instructions from Osho on the two stages of the No-Mind Meditation. Review of what happens when No-Mind happens. New perspectives on life – changes in job relationships and activities. The training will give you the ability and confidence to set up and facilitate the No-Mind Group in a safe effective and loving way including aftercare. 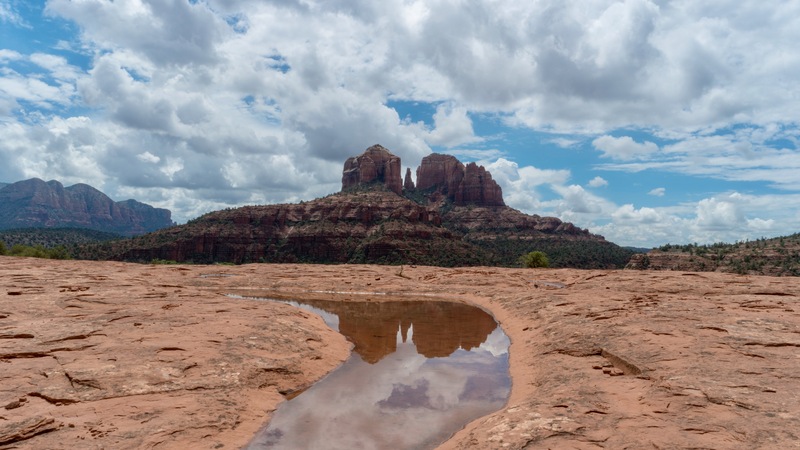 Our next No-Mind Group and Training is in beautiful Sedona, Arizona late fall 2019 or winter 2019/20. What is a Meditative Therapy? When Osho first created The Mystic Rose Meditation, he said “I have invented many meditations, but perhaps this will be the most essential and fundamental one. It can take over the whole world.” He went on to say that this will be an absolutely new and unique meditation that has never existed before in the history of mankind. He calls this work a Meditative Therapy, as it combines the two dimensions of Western therapy and Eastern meditation in one dynamic transformational process. Generally therapy groups are run quite separately from meditation groups or retreats. This new revolutionary process combines therapy and meditation simultaneously. In the Eastern approach to personal transformation, the emphasis is on being in the present moment, the here/now, also known as a state of no-mind or meditation. Relaxing to such a degree that we are able to slip out of the constant flow of thoughts, emotions, feelings and reactions, etc., and therein develop the capacity to become aware of our inner world of pure consciousness. The emphasis is on a capacity to disidentify from the nonessential and remain with the essence of presence. The Western approach offers many different types of therapies which enable us to understand and heal our neurosis, fears, anxieties and so on. Osho would often say that therapy is necessary as groundwork, or clearing the garden so that the flowers of meditation grow. Laughter clearly becomes therapy when experienced for sustained periods. It removes fear, inhibitions and loosens the energetic armoring that interpenetrates and surrounds the physical body. It enlivens, invigorates and brings out a level of vitality we seldom allow ourselves to feel. At the same time, people who are in deep abandoned laughter are thrown out of the mechanisms of mind and become totally present to this moment, to a state of No-Mind. Participants can experience an altered state of being, spontaneous, alive, overwhelmed with the delight and playfulness of laughter and joy. During these sustained periods of laughter, a healing therapy, as well as a meditative state, can be experienced simultaneously. This is a rare and unique process that is, on one hand, utterly simple and yet profoundly transformation. “Modern man is a very new phenomenon. No traditional method can be used exactly as it exists because modern man never existed before. So, in a way, all traditional methods have become irrelevant.